The Rochut editions of Bordogni’s vocalises have become the most widly used etudes in American trombone pedigogy. They are prized for their lyric beauty, and also for their development of endurance, upper range, legato technique, styling and more. Other bass clef instrumentalists use Rochut. 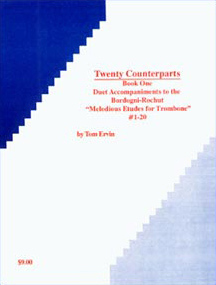 These Counterparts may be practiced and played as etudes alone. They are similar in style to the Bordogni; some are harder and some are easier than the Bordogni originals. But the primary intent was for recreational duet playing and for the trombone studio. Duets are fun and more, contributing to sightreading, intonation, ensemble, style-matching, confidence, independence, etc. As with the piano accompaniments, the duet parts also enhance the original melodies.